Carbon Emissions Rule: New Way to Skin the Cat — or Same Old, Same Old? If you trust the Obama administration, the “cat” to be skinned is global warming. If you distrust the administration, the “cat” on the cutting board is the coal industry. 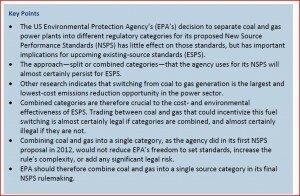 Regardless, EPA’s Carbon Pollution Rule, which would establish first-ever new source performance standards (NSPS) for carbon dioxide (CO2) emissions from new fossil-fuel power plants, appears at first glance to be one of those “other ways.” However, in a recent commentary, Nathan Richardson of Resources for the Future argues that, with a little editing, EPA can turn the “carbon pollution” rule into the legal framework for cap-and-trade. May 9 is the rapidly approaching deadline for filing comments on the EPA’s Carbon Pollution Rule, which the agency released in prepublication form in September 2013 and tardily published in the Federal Register on Jan. 8, 2014. This proposal is a do-over of EPA’s original carbon pollution rule, published in April 2012 and later withdrawn. The original rule was transparently a fuel-switching mandate — a de facto ban on the construction of new coal power plants. In the original rule, EPA set the NSPS for both new coal and new natural gas combined cycle (NGCC) power plants at 1,000 pounds of carbon dioxide per megawatt hour (1,000 lbs. CO2/MWh). EPA estimated that 95% of all NGCC power plants already met the standard (77 FR 22414), whereas no existing coal power plants came close; even the most efficient, on average, emit 1,800 lbs. CO2/MWh (77 FR 22417). The rule was perhaps EPA’s most brazen attempt to bypass Congress and legislate climate policy. The Congresses that enacted and amended the Clean Air Act (CAA) never understood themselves to be authorizing EPA to block investment in new coal generation. What’s more, any bill modeled on the rule would be dead on arrival. Adding insult to injury, the original carbon pollution rule was the culmination of a deceptive bait-and-fuel-switch strategy. EPA assured stakeholders on three separate occasions (April 2010, November 2010, and March 2011) that it would not use best available control technology (BACT) standards to redefine source categories and require fuel-switching from coal to natural gas. BACT standards are typically more stringent than NSPS and by law may not be less stringent. EPA’s assurances undercut critics who warned the agency could not be trusted with the power to regulate CO2. Had the EPA come clean about its agenda in 2010 and 2011, Senators Murkowski and Inhofe would likely have garnered more support for their efforts (S.J.Res.26, S.482) to overturn EPA’s greenhouse gas regulations. The original carbon pollution rule was weirdly contorted in several ways. (1) Under CAA §111(a)(1), NSPS are to reflect the degree of emission limitation achievable under the “best system of emission reduction” that has been “adequately demonstrated.” To pick a standard of 1,000 lbs. CO2/MWh, EPA had to pretend that NGCC is an “adequately demonstrated” “control option” and “system of emission reduction” for coal-power plants (77 FR 22394-22395). NGCC, of course, is not an emission reduction system but a type of power plant. In effect, EPA argued that a new coal plant could meet the standard by being an NGCC plant instead. (2) To subject coal power plants to the same CO2 performance standard as NGCC plants, EPA proposed to create, within the Code of Federal Regulations, a new industrial source category, “fossil-fuel electric generating units,” labeled TTTT — but only for CO2 emissions. For all other pollutants, EPA would continue to prescribe separate standards for coal boilers under subpart Da and for gas turbines under subpart KKK (77 FR 22406). (3) To deflect criticism that the administration was waging a war on coal, EPA said the rule would not actually reduce power-sector CO2 emissions and would have neither costs nor benefits! Natural gas had become so cheap, EPA argued, that few if any new coal plants would be built anyway. The rule would not “add costs” because it would simply ratify where the market was already going (77 FR 22399-22340). What then was the point? My colleague William Yeatman nailed it in a recent post on the re-do version of the rule. The objective is to position the agency to ‘add costs’ to existing coal power plants. In a leaked OMB document, EPA offered this rationale for the rule: “By statute, in order to issue emission standards for existing sources, the Agency must first propose standards of performance for new sources.” Adopting NSPS for CO2 from new power plants under CAA § 111(a) is the legal prerequisite for adopting existing source performance standard (ESPS) “guidelines” under § 111(d). The recycled Carbon Pollution Rule is still a fuel-switching mandate, although not as overtly so. This time EPA proposes two separate CO2 standards. For NGCC plants, the standard remains 1,000 lbs. CO2/MWh; for coal power plants, the standard is a tad less stringent: 1,100 lbs. CO2/MWh. That’s a distinction without a difference, because commercially-viable power plants emitting 1,800 lbs. CO2/MWh are still not within hailing distance of the standard. In the first go-round, EPA decided that carbon capture and sequestration (CCS) was not an “adequately demonstrated” system of emission reduction. The levelized costs of new coal power plants already exceed that of new NGCC plants, and according to EPA’s 2012 proposal, “today’s CCS technologies would add around 80% to the cost of electricity for a new pulverized coal (PC) plant, and around 35% to the cost of electricity for a new advanced gasification-based (IGCC) plant” (77 FR 22415). However, cost is a statutory factor in determining what is “adequately demonstrated,” and none of the CCS projects EPA cites are being built without taxpayer subsidies. The Kemper County IGCC/CCS plant in Mississippi, arguably the pride of the fleet, received a $270 million grant from the Department of Energy and $133 million in tax credits from the IRS (although construction delays caused Mississippi Power to forfeit the IRS credits in October 2013). More importantly, the Kemper plant’s cost has increased from an initial estimate of $2.4 billion to $5.5 billion — roughly 71%-89% more costly than an advanced pulverized coal power plant without CCS and 438% more costly than an advanced NGCC power plant (see Table 1 of this EIA report). So unless a utility intending to build a new coal power plant wants to go broke, it’s only real ‘choice’ is to fuel-switch and build an NGCC plant instead. Because EPA is now proposing two (slightly) different CO2 performance standards for coal power plants and NGCC plants, the updated rule would codify the standards separately under subpart Da for coal power plants and subpart KKK for NGCC plants, following EPA’s practice in codifying performance standards for conventional air pollutants. However, the rule requests comment on the pros and cons of including both standards in a newly created subpart TTTT, as in the original proposal (79 FR 1346-1347). This arcane detail may seem trivial and of interest only to regulatory nerds. But according to RFF’s Richardson, the TTTT option would allow EPA to establish a cap-and-trade program that accelerates switching from coal to gas generation. 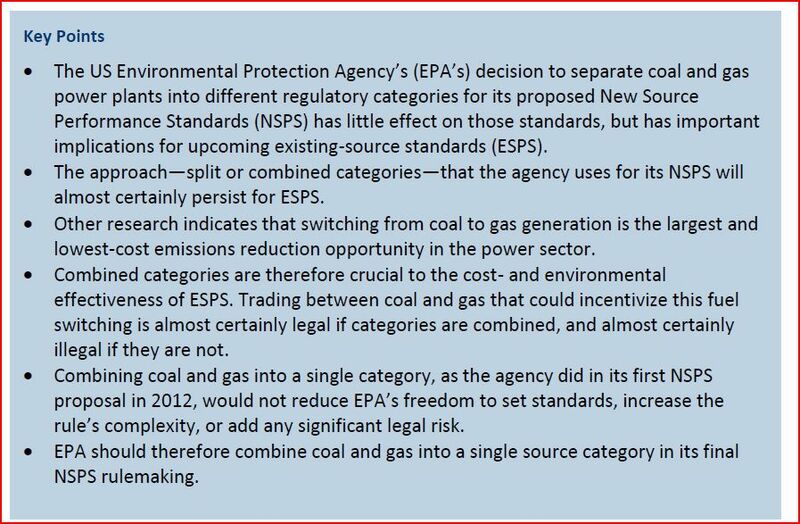 Because EPA is no longer proposing a single CO2 NSPS for both coal plants and NGCC plants, it does not need to codify the requirements in a newly-created single source category. However, as long as existing coal plants and NGCC plants are in separate source categories, a “best system of emission reduction” for coal plants essentially means efficiency enhancements, which can reduce CO2 emissions by only a few percentage points (79 FR 1435). To get big CO2 emission reductions, regulators must significantly curtail coal generation. The most cost-effective method is to place coal and NGCC power plants under a declining carbon cap and allow them to engage in emissions trading. Since CAA § 111 performance standards apply to specific source categories, emissions trading between coal and NGCC power plants is legal only if both are classified as part of the same source category. Since courts might find category TTTT to be arbitrary and capricious if it applies only to existing sources and not also to new sources, EPA’s Carbon Pollution Rule for new sources should combine existing categories Da and KKK into new category TTTT, as originally planned. Technology-based standards under the Act directed to stationary sources have been interpreted by EPA not to allow compliance through intersource cap-and-trade approaches. The Clean Air Act provisions for national technology-based standards under sections 111 and 112 require EPA to promulgate regulations to control emissions of air pollutants from stationary sources. To maximize the opportunity for trading of emissions within a source, EPA has defined the term “stationary source” expansively, such that a large facility can be considered a “source.” Yet EPA has never gone so far as to define as a source a group of facilities that are not geographically connected, and EPA has long held the view that trading across plant boundaries is impermissible under sections 111 and 112. I am still studying this issue and do not have a firm opinion about the legality of cap-and-trade as a “best system of emission reduction” within the meaning of section 111. What can’t be denied is that Congress never enacted a law proposing NSPS for CO2 and never enacted a carbon cap-and-trade program. The EPA believes itself authorized to steamroll through congressional gridlock and dictate climate policy from the bureau — and courts have been only too glad to oblige. Whether or not global warming endangers public health and welfare, it most definitely endangers the separation of powers.